In "Muse," her latest exhibition at the Houston Museum of African American Culture, local artist Jade Cooper finds inspiration in this city's vibrant black community, particularly its women. With the help of an individual artist grant from the Houston Arts Alliance, Cooper, who graduated with a degree in art from Texas Southern University in 2009, has produced a series of paintings that show a wide range of black female subjects. This fact alone makes it an unusual collection. After all, how often is our attention called to the sheer visual diversity of black American women, which, naturally, reveals both the country's long, sometimes discomfiting history of race-mixing and its multiple standards of beauty? These are not your ordinary portraits. While the female subject of each painting is drawn more or less realistically, the wider canvas is, in various ways, "infused with symbolism related to her as the subject," according to a quote from Cooper in the exhibition notes. Often the paintings seem to raise questions about mortality or suffering. 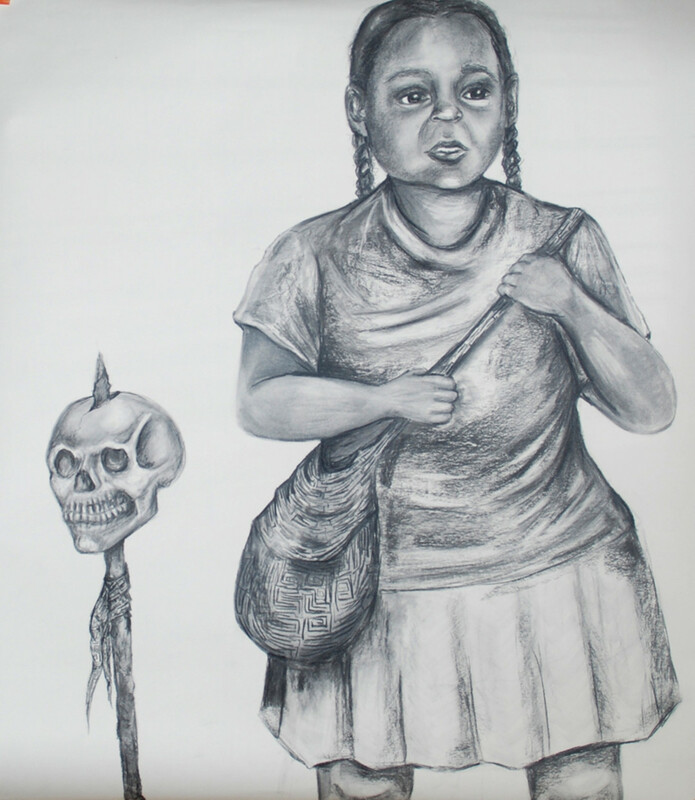 For instance, in the black and white drawing "Whose World is This," a schoolgirl with a blank, wizened face stands next to a skull on a spike. In another, a neighborhood teen stares solemnly at the audience with her arms outstretched, her sacrificial pose achingly at odds with both her beauty and youth. The contrast between the subject and the symbolism, explains Cooper, gives audience members an opportunity to "develop their own narrative to accompany the work." Indeed, visitors are invited to write down their stories about the paintings at a small table outside the exhibition space. To be sure, not all the paintings are emotionally weighty—or even portraits of women, for that matter. One of the more memorable pieces in the series is simply a still-life depicting a bowl of crab legs, a culinary symbol that ties together the artist's own roots in Houston and Louisiana. Nevertheless, one leaves the exhibition affected mostly by Cooper's vision of black femininity, which, judging by the expressions and poses of her subjects, is characterized as much by strength and grace as it is by vulnerability.